By any standards, 2014 has been a year of achievements in Midtown Indianapolis. In the first year since the establishment of the North Midtown Tax Increment Finance (TIF) district, the community received approval for proposals totaling $36 million of public and private investment within the TIF district. The $30.9 million catalytic project in Broad Ripple Village at College Avenue and the Canal will be the first to take full advantage of the Envision Broad Ripple Plan. 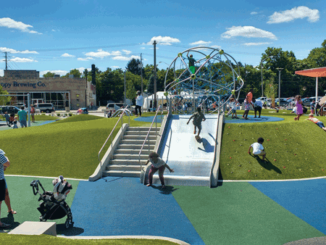 It generates $1.5 million for Tarkington Park at 38th and Illinois streets, which leveraged an additional $4 million in public and philanthropic investments for a total of $5.5 million for the park. Together, these projects create a $36 million public/private partnership that will not only bring a transformational project and millions of dollars worth of improvements to the north bank of the Canal in Broad Ripple but also a first-of-its-kind urban park in the center of Indy’s Midtown. These two projects alone have unleashed a pent-up demand for investment and helped people understand why subsidies are needed to overcome the obstacles of 320 acres of brownfields in Midtown’s Economic Development Area, along with flood plain restrictions, parking constraints, degraded infrastructure, and high cost of land. One reason why the private sector historically hasn’t invested in Midtown is because overcoming these obstacles is a lot harder and more expensive than developing cornfields. Convincing developers to make dynamic, catalytic kinds of investments in established neighborhoods has been hard. With the City’s help, Keystone Construction built the Broad Ripple Parking Garage, which spurred the Browning Investment team to move forward with its Canal Pointe project, which in turn helped kick-start Phase I of the Tarkington Park upgrade. In just one year’s time, we have seen a project started or had projects proposed in every one of Midtown’s five key development nodes. In 2015, the first two projects that were approved in 2014 will break ground, and there’s potential for groundbreaking in the other three of the five nodes, too. Everything achieved in 2014 is a function of all that has happened over the past seven years. Beginning with seven people collaborating at a dining room table, Midtown grew into seven neighborhoods, which evolved into 17 neighborhoods. That happened with hard work and long-standing efforts to create collaborative partnerships. Over the last seven years Midtown neighborhoods have worked hard to understand what people want and where they want it. From economic development, to quality-of-life improvements, to business locations, to park amenities, our neighborhoods are working to take the Midtown future plan and turn it into reality. Midtown’s successes in 2014 blew the lid off the original expectations of what we could accomplish with this planning endeavor. The historical divides—east and west of Meridian Street and north and south of 38th Street—were obliterated when residents from all Midtown neighborhoods came together to create the TIF district and an Economic Development Area that can leverage new investment. One of the most significant and far-reaching outcomes has been the realization that if we can agree on priorities and the definition of what a good project looks like and where it should go, we can stop having epic battles over land use and zoning. As a community, we have agreed that public sector investment in green spaces, connectivity, infrastructure, and mass transit are priorities for all of our neighborhoods. It turns out that when the community defines good, developers will bring the right projects. Further, we realized that these projects wouldn’t benefit only one neighborhood. New investment in the TIF district is an increase for every neighborhood in Midtown—not because every project is in every neighborhood but because the TIF priority nodes were established beforehand to benefit everyone. They were established based on fact, reason, commercial market dynamic, and community input. Every one of these nodes was chosen by its own neighborhood as the most important to improve. These commercial nodes serve every Midtown neighborhood. Each one has a three-mile service radius, and those areas intersect. The overlapping service areas of all of the nodes result in connections among all the neighborhoods. So whether you live in Mapleton-Fall Creek or Broad Ripple, you enjoy the benefits of every one of the projects. Economic development is a multi-neighborhood discussion. For example, as a result of the Broad Ripple project, four (possibly five) more projects are now in the works that collectively represent $165 million of additional investment. Add that to the $36 million already being invested, and we find ourselves poised to benefit from $200 million invested in a geographical area that has not seen anywhere near a tenth of that investment in my lifetime. 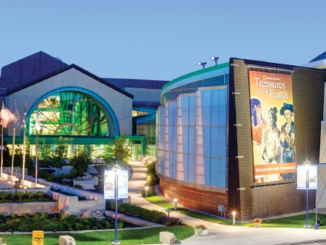 Some recent projects near this scale of investment in the Midtown geography have been institutionally driven, such as the $63 million Coliseum renovation at the Indiana State Fairgrounds, a multimillion garage and student housing complex at Butler University, and expansions of the campuses of the Indianapolis Museum of Art, Ivy Tech Community College, and The Children’s Museum. These private nonprofit institutional investments are good for Midtown and make us stronger, but they don’t solve our tax base problem. Our city has a structural deficit in excess of $50 million a year. Structural deficits aren’t one-time costs. It means the city is taking in less money than it needs to cover expenses. Why? Because we don’t have enough residents to generate revenue to cover the costs of running the city. The only way to solve that problem is to attract new people and new investments to our neighborhoods, resulting in increased tax revenue from commercial properties and new tax revenue from formerly vacant residential properties. It’s important to understand that the Midtown TIF isn’t like the downtown TIF, which has no expiration date. Our TIF doesn’t extend in perpetuity; it expires in 25 years. Our TIF is required and encumbered to replace demolition value, meaning it doesn’t take what it doesn’t create. With projects in the pipeline, TIF investments will fund projects in every node. Think about how this worked! Maybe you were one of the hundreds of people collaborating in the basement of North United Methodist Church, or in the Indianapolis Art Center, or at The Children’s Museum, talking about community planning—all of this was resident-driven. Developers will always respond when a community clearly articulates what it wants. Developers don’t want to get it wrong and waste money. Now, for the first time in decades, our community has a unifying vision that says where we want development and what kind of development we want there. We’re on the right track with the TIF to be as big and influential as possible in years one through five. We want to demonstrate to city leaders that the places we call home are worth investing in. Pretty soon we’ll start to rival the hottest investment nodes in the entire city. 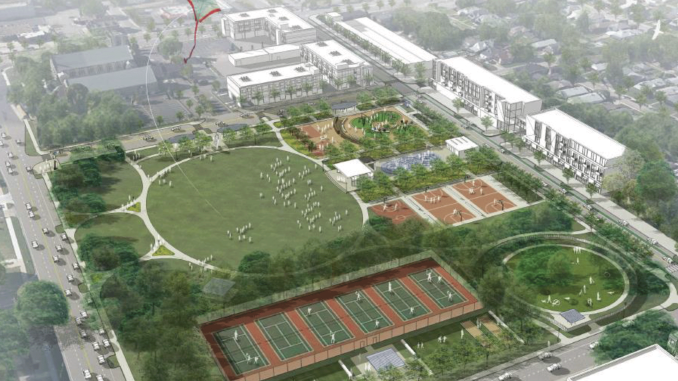 Michael McKillip is executive director of Midtown Indianapolis, Inc.
Tarkington Park rendering courtesy Rundell Ernstberger Associates. This article originally appeared in the December 2014/January 2015 edition of the magazine.